I run to work a few times a week. It takes about an hour (don’t be impressed, I’m very slow) and I hate almost every minute of it. It amazes me that anyone actually enjoys running. Whenever anyone says that they do, I always suspect they’re lying. Running is horrible and painful and exhausting. The only reason I do it is the gut-clenching fear that I’m going to keel over from a heart attack in my forties and die in a bloated, writhing mass on the floor. And I’m a bit fat. Back in my twenties – when I was a good couple of stone lighter – I used to run a lot. I was a little bit faster, and even did a few half-marathons, but I still hated it. I knew it did me good, but it boring and painful and I kept losing my toenails. Nice. Gazelle-like, graceful, swift: none of these words apply to my running style. Well, I call it running – it’s more like facilitated falling over. I’ve been assured that it looks painful to watch. My face turns bright red, I wheeze asthmatically, and my thighs thunder and wobble as my feet clump awkwardly on the pavement. And I’m slow. Oh God, am I slow! Other runners leave me for dust, mocking me silently with their long legs and smooth strides. Small children and pensioners speed past me as I heave up the Essex Road, praying for the lights to change so I can have a breather. Being a glutton for punishment, I also sometimes run at weekends in Hackney’s fine selection of parks. These all seem to have been designed by MC Escher, in that they only slope uphill. And my route to work comprises more than its fair share of ups, and not nearly enough downs. The only thing that keeps me going when I run is my mp3 player, complete with nauseatingly cheesy pop hits. I may appear to have an eclectic taste in music at most times, but only a diet of Atomic Kitten, Abba and Queen can fuel me for a run. 16th century choral music and glitchy electronica just doesn’t have the same pounding feel as Don’t Stop Me Now. Still, despite the fact that I loathe and detest it, I can’t give up running. It’s free, it’s convenient, and – surely – something that feels so bad must be doing me some good. But I’m determined not to enjoy it. 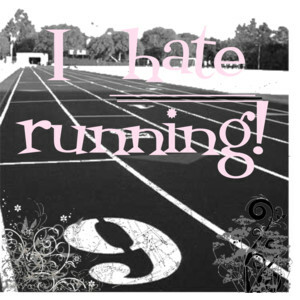 Other runners don’t feel like this, do they? Good on you Kat, for persevering, I am sure it will pay off and your fitness must be improving. I am a fellow runner and know that I have to run with others to enjoy it – if I run on my own I get too bored/knackered and stop after 10 minutes. Can you coax anyone else to run with you on way to work/at weekend? As a busy Mum, I use my thrice weekly runs to catch up with friends without being interrupted by little people. Keep it up! Am glad someone else, who is far fitter than I’ve ever been, feels the same way. Do you think it’s a conspiracy, like mothers saying that childbirth isn’t that bad, so that more of us join in ? I mean, NO, I do not enjoy running. I LOVE to walk, however, and I do it for all the reasons you mentioned (except the business about heading toward 40, I am heading toward, ahem, but, I want to be fit). Running makes the throat and mouth feel icky. Can’t stand it. The other thing I love is my piano-so I have a fondness for your musical narratives.